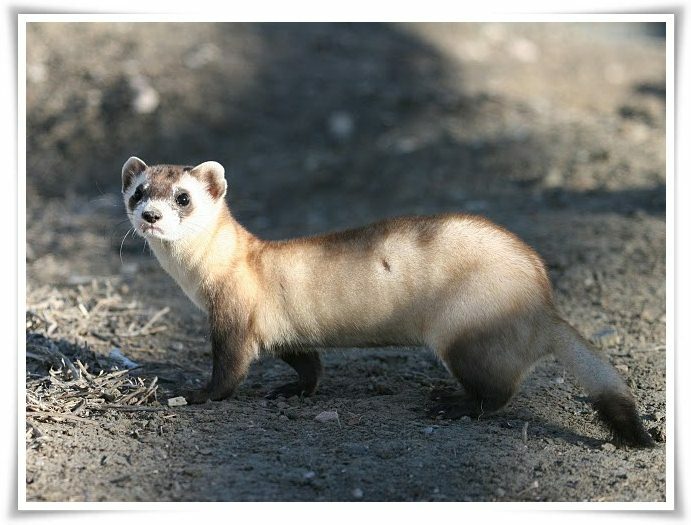 Ferrets come in many colors, but the most common ferret color is a sable grey. They belong to the same family as the weasel and have long bodies with very short legs and long necks. Most wild ferrets are found in New Zealand. Wild ferrets eat animals such as mice and rats. Pet ferrets usually do very well on kitten or cat food. Ferrets like to live around Prairie Dogs and to take residence in their abandoned burrows. Ferrets act very much like playful kittens, no matter how old they get. Ferrets tend to nip playfully, not with the intention of hurting anyone, but as a game. It is necessary to be careful until the ferret learns that this kind of behavior is not acceptable. Ferrets like to play tug of war with each other.